Spring has sprung. Hay fever time. PLEASE NOTE: All prices shown are exclusive of VAT. Please complete the VAT exemption form on checkout. If you are not eligible for VAT exemption, VAT will be added to your order on checkout. The PARI LC Sprint SINUS Year Pack includes a compressor air filter, LC Sprint SINUS Nebuliser and tube system. Established more than 30 years ago as a family business in Cardiff, we're proud to be independent, knowledgable and highly efficient. We supply many of the top brand nebulisers directly to the NHS, private customers and nursing homes which allows us to purchase the volume we need in order to acquire the lowest prices on premium, high-quality nebulisers. 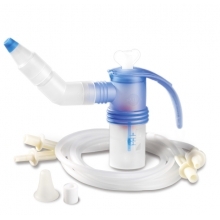 These discounted prices on nebulisers and accessories are then passed on to our customers. We aim to deliver on a next working day delivery via courier. We supply many of the top brand nebulisers directly to the NHS, private customers and nursing homes which allows us to purchase the volume we need in order to acquire the lowest prices on premium, high-quality nebulisers, offering free Next Day delivery on all order over £50. Copyright © 2018 Nebulisers Direct. All rights reserved.